Just try to survive Wikipedia’s list of fictional poisons! What it’s about: The world doesn’t contain nearly enough dangerous things. Luckily, fiction supplies plenty of imaginative ways to die undreamed of by Mother Nature. A favorite fictional bringer of death is poison, and naturally Wikipedia has collected a staggering number of fake toxins that have appeared in everything from Shakespeare to James Bond to Apollo Justice: Ace Attorney. Strangest fact: Some fictional poisons are popular enough to be re-used. 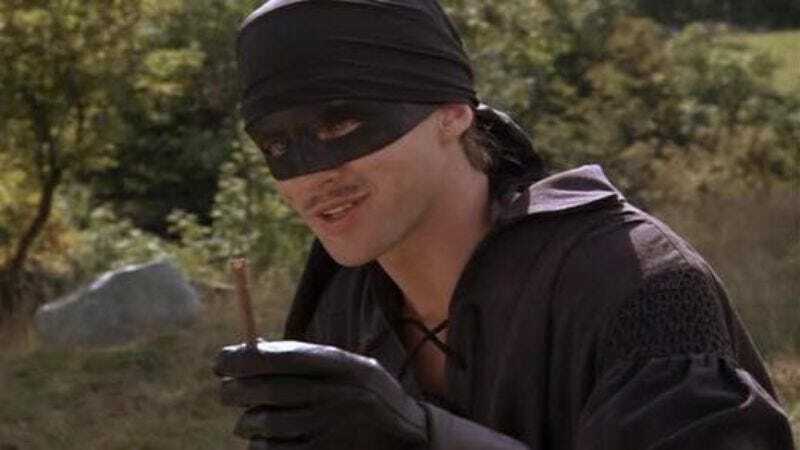 Iocaine powder—the odorless, tasteless poison used by Westley (Cary Elwes) in his battle of wits against Vizzini (Wallace Shawn) in The Princess Bride—shows up the 2010 film Jack And The Beanstalk, when Wallace Shawn’s character in that film tries to sell Jack a vial of iocaine, before fobbing off some magic beans on the boy. Dune introduced deadly meta-cyanide, and sharp-eyed Lady Gaga fans can see her using it in the video for “Telephone.” Finally, the Killmaster series of spy novels features X1, an odorless, deadly gas created by secret organization AXE, and in real life, an organization called Axe has created an airborne toxin we only wish was odorless. Biggest controversy: Not much, and while the Talk Page is mostly suggestions for poisons to be added to or subtracted from the list, one user writes, “I think this article should be deleted. It has absolutely no point. Why would anyone read a list of all fictional toxins? I can’t think of a situation.” Clearly the user is not familiar with either Wikipedia or the Internet in general, and the request was not granted. Thing we were happiest to learn: Not all poisons kill. The list also includes a category for mutagens—poisons that change their victims in some way, rather than killing them. Mutagens on the list include Chemical X, which was used to create the Powerpuff Girls; Pax, which inadvertently created Firefly’s Reavers; several agents that give super strength or other powers; and varying colors of Kryptonite, whose effects range from killing Superman, to weakening Superman, to doing whatever crazy thing to Superman the writers dream up for a particular issue. Thing we were unhappiest to learn: Fictional poisons aren’t necessarily plausible poisons. While most made-up toxins have believable effects—shutting down various vital organs, causing severe illness, or making the victim hallucinate—some authors aren’t looking for a particularly realistic bringer of death. The Chinese novel The Return Of The Condor Heroes mentions the passion flower, a poison that “causes severe pain any time the victim thinks about love,” which means the plant-based toxin can either read thoughts, or acts as a deadly mood ring. Pyramids, in Terry Pratchett’s Discworld series, includes a poison called bloat, which causes every cell in the body to expand in size—deadly and believable enough, except that cells expand 2,000 times over, making the victim roughly the size of a two-story house. The most ridiculed, if not the most ridiculous, toxin on the list is the plant-based airborne agent from M. Night Shyamalan’s The Happening, that makes its victims immediately commit suicide by “basically flipping the preservation switch, blocking neurotransmitters in a specific order.” Science! Best link to elsewhere on Wikipedia: Many of the poisons on the list come from comic books, but most of those are from a particular comic. Terrigen mists is a mutagen which grants superpowers, but often at the cost of physical deformity. Its source isn’t listed as one particular comic, but comes from the Marvel Comics’ universe in general. Click that link for a rabbit hole of alternate universes and conflicting continuities that you might never escape. Further down the wormhole: The “See Also” section links to similar lists, including fictional elements, fictional medicines, and discredited substances. That last list contains things once believed to have existed but now disproven by science—the aether that supposedly made up heavenly bodies, and several physical manifestations of our life force. These discredited substances often appear in discredited scientific theories, which we’ll explore next week.